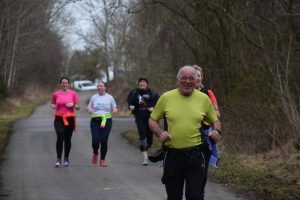 News | Blackhill Bounders Running Club. Once again we’re running a lap of the Derwent reservoir to celebrate our anniversary. It’s a fantastic run and we’d like as many as possible to join in. A full lap is 9 miles, but we’re adding some joining points if you don’t fancy the full lap! We don’t have sole use of the cafe due to it being open to the general public. Due to this we won’t be able to provide a buffet this year! The owners suggested hot yorkshire pudding wraps, these are available in beef, chicken and vegetarian options for fillings. The club have agreed to part-fund them but would like a £3 donation per person per meal. 10.00am Start at Pow Hill – The pace will be very sociable so should cater for all abilities- nobody will be left behind. If anyone wants to go a bit quicker they can set off a little later. Alternatively you can meet at 10.30am (approx), Carricks picnic site (closed now but you can still find it) 6.5 miles from here. 11.00am (or when the tail runner gets there- but not sooner) – Mill Shields picnic site- it’s just over 3 miles to Pow Hill. This is where our Juniors will join us. The aim is for us to try and finish together. It won’t be easy to all run together but we can all try to finish together. Once finished it’s into the Boat Shack. For those who are really keen, some are doing some extra miles. Aidan Hughes and a few others are planning on starting at 8.30 to do 2 laps and I know others are planning similar- I’m sure they will share details of these start times. Hope to see as many people there as possible, we are so luck to have this beautiful route on our doorstep. It’s a sociable day – and we’re good at that! For those new to the Bounders it is also a great opportunity to get to know other members of the Club. Reports from the Chair and Treasurer on the progress of the club in 2018. Elections of the Management Committee for 2019. Any other Business to the Club Secretary by 17th January 2019. Following on from last year’s very successful run down to the Kings Head at Lanchester on New Year’s Eve, Mike Swainson has kindly organised to do the same again this year. Monday 31 December – New Years Eve 6 mile run to Lanchester Kings Head. 10am start from Morrisons car park. Bacon sarnies are available from 11am. Full menu available from 12. If you intend to park at Morrisons please be mindful of the 3 hour parking limit. Park elsewhere if you intend staying longer than 3 hours. If you can make your own transport arrangements, however there is a bus service if needed. Would be helpful but not essential if you could let Mike know if you intend to run – just so he can give Kings Head an indication of numbers. As usual it is a “run at your own pace” and there will be a tail runner.